The Sketch printed two or three stories in each issue, mostly "society" stories, but also mysteries. Agatha Christie's first twelve Poirot stories appeared in The Sketch in 1923 under the general title "The Grey Cells of M. Poirot." The magazine also published a noteworthy series called "Tales with a Sting," which included contributions by Edwin Baird, E.M. Delafield and Marjorie Bowen. The following image of an 1894 issue of The Sketch will give the reader an impression of the appearance and "feel" of the weekly during the late Victorian and early Edwardian period. 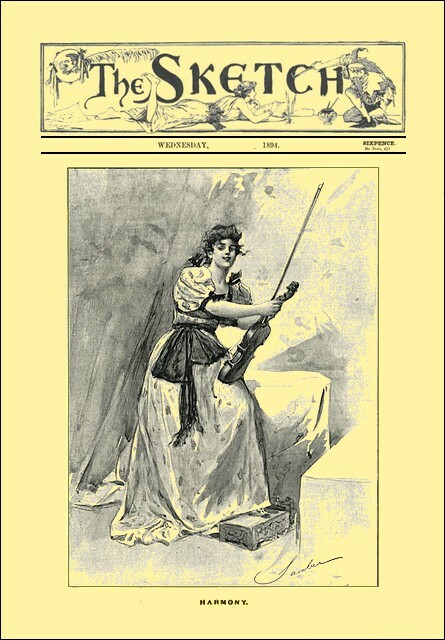 Cover of an 1894 issue of "The Sketch." 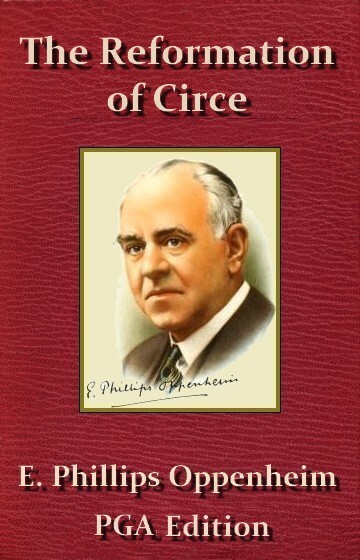 "The Reformation of Circe" was syndicated for publication internationally. The bibliographic record is obscure in this respect, but a file at the Old Fulton NY Postcards site shows that one of the US newspapers in which it appeared was The Democratic Herald, Clyde, NY, which printed it on December 28, 1904. —Roy Glashan, January 3, 2017. "FOR the last time, then—"
Ransom looked sorrowfully into his friend's face. The note of finality in that brief negative was unmistakable. And the pity of it! Immense! Inexpressible! "I shall not come again, Derrator. But now that you are sending me away—we shall likely enough never meet again—you are going to hear the truth!" "Be patient, my dear friend," he murmured, with a faint note of irony in his tone. "I am going to hear your view of the truth." "I do not accept the correction," Ransom answered, quickly. "There are times when a man can make no mistake, and this is one of them. You shall hear the truth, and when you have spun out your days here to their limit, your days of sybaritic idleness, you shall hear it again—only it will be too late. Mind that—it will be too late! You are fighting against Nature. You were born to rule, to be master over men. You have power—the gift of swaying the minds and hearts of your fellow-creatures. Once you accepted your destiny, your feet were planted firmly upon the great ladder, you could have climbed—where you would!" "My friend," Derrator murmured, "it was not worth while." Ransom turned upon him fiercely. "Not worth while! Is it worth while, then, to loiter in your flower-gardens, to be a dilettante student, to write fugitive verses, to dream away your days in the idleness of purely enervating culture? Life apart from one's fellows must always lack robustness. You have the instincts of the creator, Derrator. You cannot stifle them. Some day the cry of the world will fall upon your ears, and it may be too late. For the place of all men some time or other is filled." Derrator lit a cigarette, and took his friend by the arm. "Come," he said. "You have plenty of time for the train. I will tell the carriage to go on to the top of the hill. I want to show you my possessions." Ransom recognised the purpose in his friend's invitation. Together they climbed the mountainous path. At the summit Derrator paused. "It is a beautiful view," Ransom admitted, coldly. "Look again," he said. "There is the sea, the moor! Turn your lace to the wind: can you smell the heather? We have left the rose-gardens below, Ransom. This is Nature—the mother, the mistress beneficent, wonderful! You are a man of cities. Stay here with me for a day or two, and the joy of all these things will steal into your blood—and you will know what peace is." "Peace is for the dead," Ransom answered, fiercely; "the last reward, perhaps, of a breaking life. The life effective, militant, is the only life for men. Break away from it, Derrator, for God's sake! Yours is the fainéant spirit of the decadent. Were you born into the world, do you think, to loiter through life an idle worshipper at the altar of beauty? Who are you to dare to skulk in quiet places while the battle of life is fought by others?" Derrator smiled quietly—the smile that Ransom hated. "Dear friend," he said, "the world can get on very well without me, and I have no need of the world. The battle that you speak of—well, I too have been in the fray, as you know. The memory of it is still a nightmare to me." "You were ill-treated, Derrator," Ransom interrupted; "but your return would be all the more a triumph. You will go straight into office. The Premier himself is your suppliant." "Let us confine our conversation to generalities," he said, dryly. "Do not think that I nourish any resentment against the Party for whom I laboured. I owe them nothing but thanks for driving me out. Only, I have learned my lesson. The strenuous life which you would glorify I have tried and found wanting. All the great causes of life are honeycombed with the disease of man's ambition and vanity and greed. For me the bottom has been knocked out of the whole thing. I have found here the life that satisfies me. Come and see me when you will, Ransom, but never again as an ambassador." And Ransom was silent, because he had no more to say. The two men stood side by side, watching the carriage from below crawl up the hill. Before it reached them, however, the horn of a motor-car, approaching in the opposite direction, drove them to the side of the road. They both turned. A slow, enigmatic smile transformed Ransom's face. After all, there was hope, then. The car passed them—without undue speed, but enveloped in a cloud of dust Derrator watched the woman, and Ransom watched the man who had once been his bosom-friend. He saw the woman's languid curiosity flash from her deep-blue eyes, Derrator's arrestment of all expression, sudden, faint start as the woman's lips curved into what, with longer waiting, might have developed into a smile. The episode, if it could be ranked as such, was over. Ransom, from his seat in the carriage, leaned over to say a final word. "My mission, Derrator," he said, "must be written down a failure. Yet I am one of those who cling to thin chances, so I want you to remember this. All that I have said remains in force for six months from to-day. The solitude which has brought you a certain measure of madness may carry in its bosom its own antidote. Therefore, I shall not despair. Au revoir, Derrator!" "Farewell!" Derrator answered, with a wave of the hand. She came to the boundary-hedge, a gleam of white, tall, a little ghost-like with the smooth grace of her silent movements. She was bareheaded; she came to him out of the late twilight as one walking through a mist. As she walked she sang softly, at first to herself, then to him. He heard her, frowning. He was pale and nervous. "Is it true," he asked abruptly, "that you are going?" "But why not?" she answered, with gently upraised eyebrows. "One does not come to such places as these for always. One sleeps through the night, but the daytime—ah, that is different!" "You have been contented here?" "More than contented! I have been almost happy," she answered. "Then why go back?" he asked, with a sudden fierceness in his tone. "What is there in the world so beautiful, after all? Here are the sun; and the sea, and the wind—it is the flower-garden of life. Stay and pick the roses with me!" "I am not like that," she answered, slowly "Life may have its vulgarities, its weariness and its disappointments, but it is the only place for men and women. The fight may be sordid and the prizes tinsel—yet it is only the cowards who linger without." "Still, you have been content here," he repeated, hoarsely. "Content to rest," she answered; "but one does not sleep for ever. We were, neither of us, born to linger in a maze of abstractions. The contemplative life is for the halt and maimed of the world. We others must carry our burden into the thick of the battle." "You speak to-night in allegories," he said. "You mean that you will return to London?" "And leave me here, after these days together—after everything." Her eyes sought his, and the man's heart beat to passionate music. "That," she murmured, "is as you will, Sir Hermit. Only it is certain that I must go. As for you—well, you are a man. It is for you to choose." He sprang over the low paling. She swayed towards him with outstretched arms. Together they passed away into the world of shadow. "You wonderful woman!" Ransom murmured. "What can we give you? A peerage in your own right, a diamond tiara—?" "Don't talk nonsense!" she interrupted, a little sharply. "The Governorship for Herbert was all that I asked, and that he has. For the rest, I wonder sometimes—I wonder whether I do not regret." Ransom stared at her in amazement. "Yes. I do not believe that he is happy." Ransom sighed meditatively. After all, the ways of women were indeed mysterious. "Pardon me," he remarked, "but that sounds a little sentimental, does it not?" "If it is—what then? Am I too old or too world-weary for sentiment?" Ransom was not at his ease. "You amaze me, Adelaide," he said. "I regard you—we all regard you—as Derrator's saviour. He had committed moral suicide; it was you who disinterred him. The world owes you much for that; we owe you more; Derrator, perhaps, owes you most"
"Perhaps," she murmured; "perhaps not." "But I do not understand your hesitation," Ransom persisted. "Derrator's career was ended. It was you who brought him once more into touch with great things, and you can see for yourself the outcome. Did you ever know a man grip the helm more firmly? He will be Prime Minister in five years." "Prime Minister, perhaps; but will he be happy?" she asked. Once more Ransom looked at her in surprise. "Happy, Adelaide! I do not understand you. The man's career was ended. It was you who brought him back before the footlights. Of all your achievements I think that was the greatest." "And of all my achievements," she answered, "it is the one of which I am least proud. You and I are both worldly persons, Ransom, but I yield the palm to you. To tell the truth, I am not happy about Derrator." "You lingered too long with him in his lotos-land," Ransom said, with a subtle note of mockery in his tone. "His rose-gardens were very beautiful, but there was poison in every blossom—the poison of honey-flowers, you know. I trust that none of it has found its way into your veins." "I am not so sure," she answered, a little defiantly. "After all, a man is great by what he is, not what he does." "Hush! He is coming," Ransom said, quickly "I am going to find Milligan. Find out what he has decided about Duncan's offer." Derrator sank into the seat which Ransom had vacated. He was tired and there were dark lines under his eyes. The woman watched him closely. "You are weary," she whispered. "It is nothing," he answered. "Already I have forgotten it. I have been looking for you." For once she was tongue tied. She knew well that the psychological moment had arrived. Every muscle of his face seemed set into nervous lines. "I have been looking for you," he repeated, in a low, deep tone, his eyes fixed steadfastly upon her. "I have something to say." "I think," he continued, "that to-night I may speak. I have obeyed your call. For your sake I have broken a vow which had become to me almost a holy thing. The time has come, Adelaide, when I claim my reward." For the moment she was evasive. Her eyes were fastened upon his face, as though she would read his unspoken thoughts. "My friend," she said, "that sounds a little like an accusation. I persuaded you to break your vow because I honestly believed that you were wasting your life. I thought that you only needed to feel yourself once more in touch with the great world, and your only regret would be for the years which you had wasted. To-night I have been watching you, and I am not sure that I was right." He looked straight ahead. Could he, too, she wondered, be wandering once more in the world of shadows where the cedar-trees drooped low and the perfume of the roses hung heavy upon the air? Underneath the lace of her gown her bosom was quickly rising and falling. She leaned forward and touched him on the arm. "You shall have your answer," she whispered, "and it shall be 'yes.' But there is a condition." The momentary flash of joy in his race died away. "Another!" She leaned a little forward. "Do not be afraid, dear," she whispered. "The condition is only this—that you take me back to where I found you. Only a little while ago I was a missionary; to-day I am myself a convert. Let us go back together—and hear whether the nightingales are singing still!" So Derrator was never Prime Minister, after all.